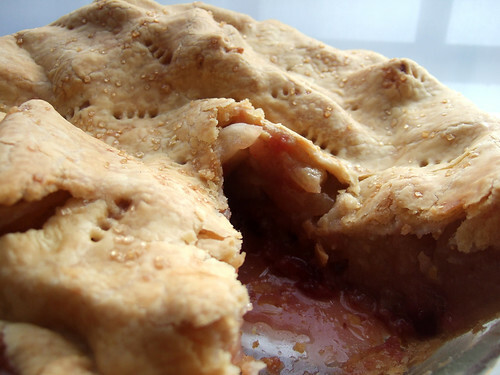 After Thanksgiving, I had an extra bag of cranberries in my fridge and a strong hankering for some apple pie. I've had plenty of apple cranberry crumble in my time, but it was time to bring the ingredients together in a pie. My first impulse was to just throw some cranberries in along with the apples, but I decided to do a recipe search and found Cranberry-ribbon Apple Pie which calls for cooking and cooling the cranberries before adding them to the pie. This sounded like a safe bet for my first apple cranberry pie. I've adapted the recipe below. I didn't have any cranberry juice on hand, so I just used water. I also cut back on the total sugar by 1/2 cup (reflected below). I might even cut it back more next because I appreciate a tart bite. I'd recommend adjusting the amount of sugar according to your own preference. I've yet to invest the time and energy in mastering pie crust dough, so use your favorite tried-and-true pie crust dough recipe (this one is supposed to be a dream), or cheat like me and use store-bought crusts--obviously not as delicious as homemade, but good enough. Stir 1/2 cup sugar and juice (or water) in saucepan over medium-high heat. Add cranberries; bring to simmer. Reduce heat; simmer until almost all liquid is absorbed, stirring often, about 25 minutes. Cool. Toss all apples, flour, lemon juice, 1/2 teaspoon cinnamon, and 1/2 cup sugar in large bowl to blend. Preheat oven to 400°F. Roll out 1 dough disk on floured surface to 13-inch round. Transfer to 9-inch deep-dish glass pie dish. Trim overhang to 1 inch. Spread cranberry mixture over crust bottom. Top with apple mixture; dot with butter. Roll out second dough disk on floured surface to 13-inch round; drape over apples. Trim overhang to 1 inch. Press crust edges together to seal; crimp. Cut 1-inch hole in center. Brush crust with milk. Mix remaining 1 tablespoon sugar and pinch of cinnamon in small bowl; sprinkle over crust. Bake pie 15 minutes; reduce oven temperature to 375°F and bake until crust is golden, about 50 minutes. Transfer to rack; cool at least 2 hours. (Can be made 6 hours ahead. Let stand at room temperature.) Serve warm or at room temperature with vanilla ice cream.